An unusually charged Prime Minister Yousaf Raza Gilani on Tuesday lashed out at Pakistan Muslim League-Nawaz (PML-N) President Nawaz Sharif, without naming him, for advocating the establishment of military courts in Karachi in the National Assembly, with members from coalition parties thumping their benches in support of the prime minister as he said the practice of calling the army in aid to civil administration “erodes civilian authority”. Referring to Sharif’s statement, the prime minister termed it a double-standard and questioned the rationale behind the idea, saying it was impossible in a democratic setup. “In a democratic setup, there is no room for military courts. If such kinds of courts are set up, what will be the difference between democracy and dictatorship?” he asked. He said the military should always be kept in the background in a democratic setup, otherwise civilian authority would decrease. He said Rangers were already deployed in Karachi on the request of the provincial government to improve law and order. Gilani also came out in the open to support the creation of a Saraiki province, stating that if he could not give recognition and rights to his people, who else would. “No one can suppress the aspirations of the people. If a Saraiki province is not created while I am here, when will it happen?” he said angrily while responding to the remarks of Sardar Mehtab Khan of the PML-N, who had claimed that whenever the prime minister visited his hometown (Multan), he made such remarks, which might disintegrate Pakistan. “These remarks are highly objectionable. We are among the creators of this country. Our forefathers contributed to its creation and they struggled besides Quaid-e-Azam Muhammad Ali Jinnah and this is a historical fact,” the prime minister said. He added that a Punjab governor, during Zulfikar Ali Bhutto’s rule, was Saraiki and even when Benazir Bhutto came into power the Pakistan People’s Party (PPP) had elected a Saraiki president. “Now a non-Sindhi and a non-Bhutto is a prime minister and I am a Saraiki too. This is the respect of the PPP for the Saraiki people,” he said. Gilani directed PPP Chief Whip Khurshid Shah to discuss the Muttahida Qaumi Movement (MQM)’s resolution on new provinces with all parties and open a debate in this regard. Gilani said it was the objective of the PPP to remove the sense of deprivation among the people of remote and underdeveloped areas, adding that had past regimes addressed the sense of deprivation in smaller provinces, Pakistan would have not disintegrated. He said a proper mechanism should be adopted to move a resolution for the purpose, adding that nobody could block the resolution as it was in accordance with the aspirations of the people. Gilani said he had read another funny statement that alleged that he was struggling for the creation of a Saraiki province to pave the way for his son to become chief minister of the new province. The prime minister said the demand for a Saraiki province was not a new one as Multan was the capital of Sindh some 5,000 years ago when Hindus had a different identity. Hence, it was a legitimate demand of the people of that region, he added. The premier said if parliament ensured the rights of Pakhtuns and the people of Gilgit, Baltistan and FATA, it was impossible that it would not give an identity to his area. “Let me tell you that the demand for a Saraiki province is not to weaken Pakistan. Giving rights would rather strengthen the country. We have implemented all the resolutions regarding Balochistan except the law and order situation, which is a provincial subject,” he said. Gilani said a delegation from Hazara had met him and discussed the issue of a new Hazara province. “Forthwith, I talked to ANP (Awami National Party) chief Asfandyar Wali Khan and asked him how the issue could be resolved. 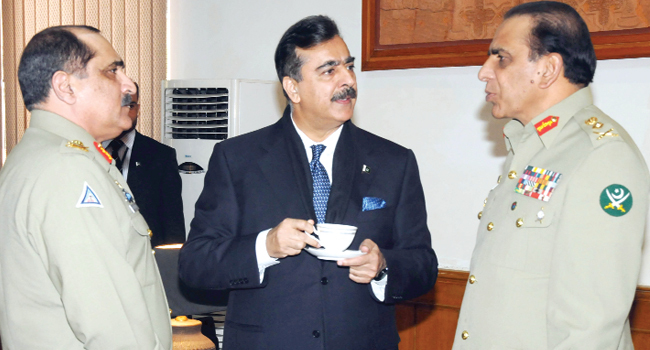 In response, he said if the PPP has consensus on the issue, it could be discussed in the House,” said Gilani. The prime minister said he referred the matter to the PPP’s parliamentary party and the party fully advocated federalism. He dismissed the allegation that his party was weakening Pakistan, adding that the country was guarded by the constitution, which was given to it by the PPP and provided a guarantee for its security. Responding to the prime minister’s remarks, Mehtab said East Pakistan seceded when the PPP was in power. “We are not responsible for Pakistan’s disintegration. The prime minister would get his answer if pondered upon. If rights were given to Bengalis, East Pakistan would not have disintegrated,” he said. He also said Nawaz Sharif’s statement was distorted by the media as his party had struggled against army rule. Haider Abbas Rizvi of the MQM hailed Gilani, stating that by endorsing the MQM’s resolution, Gilani had made the day historic. “What enmity do you (PML-N) have with the people of Karachi? You had set up military courts under which our workers were hanged without trails. Who is responsible for those killings? The apex court had held those courts illegal,” he said. Referring to the military courts set up by former president Pervez Musharraf’s regime, Haider asked Nawaz how much justice he had received from military courts. “Why did he claim he was punished against the law? You don’t even bother if 15 people are killed in a day in Lahore, but if a single person is killed in Karachi, you are up in arms,” he said. Strongly condemn Nawaz Sharif's statement on military courts. He represents a mindset. The number of heinous crimes committed in Punjab are much more than Sindh. Why does he not talk of military courts in Punjab? Why is Chief Minister Punjab calling in Army in aid of civil administration? Perhaps this is his way of courting Army. No more courts of any kind except public courts. The rulers will face their destiny in public courts soon.